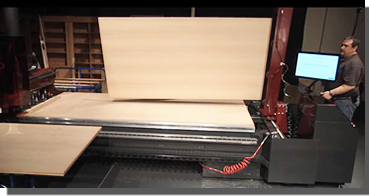 A CNC router operates in a sophisticated technical environment. Computers and sophisticated design software are used to design cabinets, layout kitchens and create the CNC programs needed to make those kitchens. An operating environment has developed around these capabilities that the industry has become accustomed to. It takes a highly-skilled and trained operator to program and operate these machines. First, there are no computers or design software. Everything is already in the machine. There is no programming. The cut center doesn’t need a computer to tell it how to move because it already knows how to make cabinets. To understand how this approach fits into the operating structure of a shop you must first realize that cut centers have been designed for cabinetmakers who are already running a successful business and simply want to make what they are doing more efficient with the least disruption possible. They don’t want to change from woodworkers to computer programmers but they would like to make their products faster, better and at lower cost. The cut center works through a large touch screen which essentially performs three functions. First, it allows you to adjust settings that tell the machine how you want to work, plus it watches routine maintenance and tooling. The other two areas are picking what you want to make and actually making it. To pick what you want you have to know what you want. If a shop is operating, they have already developed some way of determining what they need to make. Some may do it by hand, other might use software or drawings or whatever works today. The cut center doesn’t mess with this area. Whatever you are doing today is what you will do with the cut center. Once you know what you want and the sizes you need, picking it is intuitive and easy. Pretty much anyone can do it the first time, even if they have never seen the machine before. 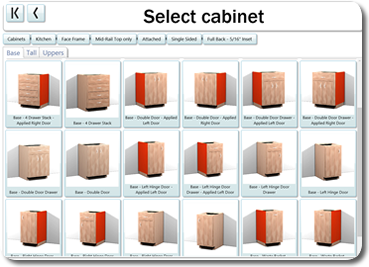 You do need to know how you want your cabinets made, but you don’t need to know anything about the machine. You will group all the cabinets you want to make into a job which the machine will nest together and cut. If you want, you can create a job but not necessarily run it right away, which is probably what most people will do. When you create a job and process it, the machine will tell you how many sheets of each material you will need and how long it will take to cut all the parts. This information can be quite useful when you are working with a customer and developing a quote. Once you are ready, it is simply a matter of calling up the job and running it. Going back to the list of material, it not only tells you what material you will need but also tells you in what order the materials will be needed. You can print this out and use it as a pick list to load the handling carts. The Cut Ready Cut Center comes with two tilt carts that make it easy to retrieve and stage the material for a job. While you are working off of one you can be picking material for the next job. Once the cabinet boxes are complete, you can make drawers, doors and drawer fronts. These are easy. Simply select the type of drawer and the door and drawer front designs you want and tell it to make them for your job. If you don’t want to use the machine for your doors and drawers the machine will print out a list of sizes for you. Another interesting aspect is that you can stop a job between sheets at any point and then finish it later. This is great when you go home at night or if you have to work in a “hot” job in the middle of regular production. Some of the operations of the machine would be familiar to anyone who has operated a CNC router but a number of areas are different. Let’s start with loading. First, the cut center manages the vacuum system. It turns the pump on and off and turns vacuum to the table on and off. When you are told to load a sheet, it pumps air through the table, sort of like an air hockey table, to make it easier to slide the sheet. It also uses special sensors that detect when the sheet is tight against the location stops. When this happens, the machine turns off the float air, turns on vacuum and drops the location stops, all automatically. Another difference is the “clicker”, which is a fob-like device you wear around your neck. The silicone cord necklace for the clicker uses magnetic catches so if it gets caught it simply pulls off. This clicker is used to communicate with the machine so you don’t have to go back to the control every time you want to do something. It also allows you to stop the machine when it is cutting, so you don’t need to stay near the stop button while the machine is running. When you get used to the position sensors and the clicker, things that were awkward before become simple, natural and easy. There is a major difference in the way the cut center handles parts that need to be machined on both sides (more complex pieces like closets or cabinets made from single sided material often require machining on both sides). CNC routers generally cut the front side, cut the parts out and then machine the back side one part at a time. Not only is this difficult, but it can be confusing and is prone to error. The cut center takes a different approach. It starts by loading the sheet, back side up and doing the back side machining first, on the whole sheet. It then flips the sheet over and machines the front side. When the parts are cut out, they are complete, front and back. A really unique feature of the cut center is that it has a “flipper” on the front of the machine that flips the sheet over, so this process is really easy. Just slide the sheet into a clamp located just off the front of the table and the clamp grips the sheet and rotates it 180 degrees, all within the confines of the table. When you first load your sheet, if the backside is not up, you can use the flipper to fix that too. Tooling is also handled differently with a cut center. The machine manages tooling so you don’t have to. It uses standard “Cut Ready” tools. Each tool is numbered and has a “Chuck Line” showing how far to insert the tool into the tool holder. When a tool needs to be changed, the machine brings it to you and tells you which tool bit to insert. It then measures both the length and diameter of the new tool and adjusts all the tooling parameters. If you load the wrong bit by accident, it will know and will bring it back and ask you to fix it. Since the machine knows when a tool is changed, it also knows how long that tool lasted. After a while, it knows about how long each tool will last in your operation and will warn you when a tool nears its historical life. This can prevent cutting scrap parts because of dull tools. Another area that needs attention is vacuum hold down and waste board management. The “waste board” is a quarter inch thick board that sits on top of the table board. As parts are cut, shallow channels are cut into the waste board and eventually it needs to be resurfaced. Resurfacing is a simple automatic process that can be performed, even in the middle of a job. The machine keeps track of cuts in the waste board and warns you when it needs to be resurfaced. It may even require that you resurface it if it knows that parts on the next sheet will move. While this doesn’t cover every aspect of running a cut center, it should give you a flavor of what it is like to run this next generation of cabinet machines. They are flexible, easy and require a lot less technical skill and training. This almost makes cabinetmaking fun again. You can see and get hands-on experience with the IWF Challengers Award Winning Cut Center when it makes its Canadian debut November 6th and 7th at the CNC Automation Open House. You can also contact us here at Thermwood to arrange a free personal and interactive demonstration here at our Dale, IN headquarters.